Sometimes a bar is just a bar. Other times a bar is just a delicious taco joint. Or just the most popular brunching beer hall in town. CHICAGO – I've always fancied myself a New York food snob, but after a two-day food-blitz in Chicago, I fancy myself a Midwest food snob as well. Especially after tasting what's on offer at two casual standouts that made the trip: Big Star and Publican. Lunch at Big Star starts slowly enough. It's in Chicago's relaxed Wicker Park neighborhood, which reminds me a little of the Lower East Side in the early aughts. The old mechanic garage has a big glassed-in patio that fills the place with warm sunlight even on blustery cold days. There's a Portland-meets-Austin vibe inside: a deliberate mix of country music, flannel shirts, and high-tech strollers. The bar takes up most of the restaurant, and is the best place to sit if you like to get a bit of staff action. We immediately order a drink off the menu called Lizard Boots, a jalepeño-infused tequila, Lone Star beer, lime juice, and salt. If you like to start your day with a little aggression, there's a whiskey menu. Order up: guacamole and chips, one taco el pastor, one taco de pescado, one chiles torreados (grilled, salted jalepeno peppers), and a Big Star Hot Sauce. Nothing gets between a girl and her Mexican food. First bite, second bite, third bite, gone. It's a street-style taco with a touch of gourmet, and I'd expect nothing less from wildly popular chef Paul Kahan (Avec). Plus, you're not going to get much better for the $3 taco tag. I spot an enormous hotdog with all the fixings (described by the bartender as a bacon-wrapped weiner with pinto beans, lime mayo, mustard, onions, and hot sauce). Think about the siesta you'd need after that one. 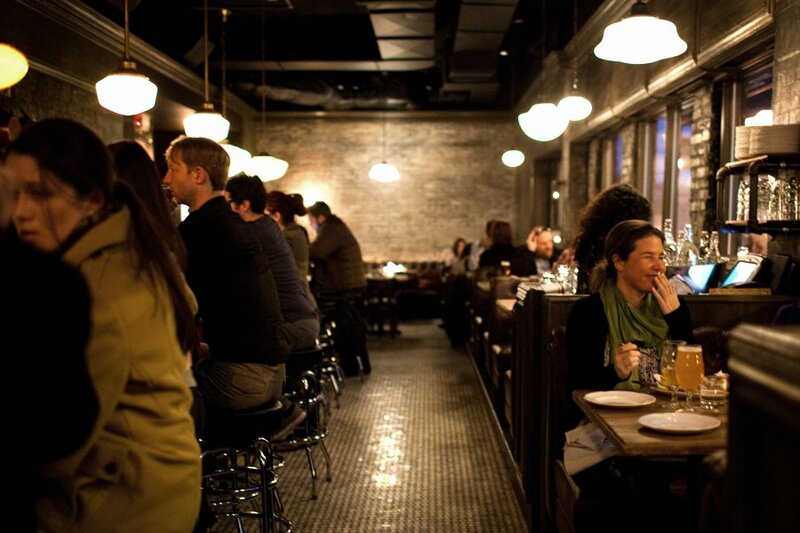 Sunday morning brunch takes us to The Publican (Big Star's sister restaurant) in Chicago's Meatpacking district. The hungry, foggy-eyed crowds file in, taking over the beer hall's tall-boy tables, clinking mimosa glasses, and sharing pastries while waiting for seats at the communal table or, better yet, one of the big wooden boots (with doors). The mood is boisterous, to say the least. This calls for a strong cup of joe (bottomless Intelligenstia, $3) plus a Bloody Mary (Tito's vodka), which is served with a "beer accompaniment." Chicago likes its beer back. Okay, let's go with the North Coast Brewing Old #38 Stout. My brother Rory orders the massive weiswurst served with a German pretzel. My sister-in-law (a sport to appear after the haze of law school graduation) is all over the shrimp with dirty rice. My husband opts for the soft-shell crab sandwhich. I order the red wine-poached egg plus a few thick slabs of bacon for the table. The food is so good, the table is silent. It's like being in church. Post-brunch confession: I cannot resist taking one of the embroiderd napkins as a souvenir.